The Progressive PL8 Gourmet Slicer is a high-quality slicer, with 3 different slicing thickness settings, a classic julienne and a french fry cut. The safety hand guard protects your hands and fingers while slicing. Indulge in fresh citrus for cooking, cocktails or a splash of flavor in salad dressings and marinades using the classically inspired Progressive PL8 Citrus Juicer. Lemons, limes and oranges release their juices when pressed onto the reaming lid. The Cole & Mason Ceramic Salt Keeper is a high quality salt keeper with a glazed exterior gives a stylish, glossy finish, whilst the unglazed interior helps to absorb moisture, keeping salt dry. Ideal as a gift to add style to any kitchen or table. Our ceramic salt keeper is perfect for on-the-spot seasoning whilst cooking, to quickly grab a pinch of salt with your fingers or use the stainless steel spoon. This is the perfect tool for every day seasoning in the kitchen to a functional, stylish accessory for the table. Salt keepers are ideal in the kitchen when cooking pasta, rice or potatoes or curing meats, where a larger quantity may be needed. Since 1850, Emile Henry has been the pioneer of Ceramic cookware, kitchenware, ovenware and tableware products. Emile Henry has established a worldwide reputation for manufacturing the finest quality ceramic ovenware, gourmet cooking products, and bakeware products. 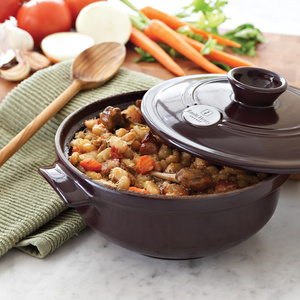 All Emile Henry cookware is handcrafted in France. The Emile Henry 30cm Red Pizza Stone is perfect for creating a delicious pizza using your barbecue, creating a delicious crispy base without burning it. The Emile Henry Red Ceramic BBQ Plancha is ideal for cooking a variety of foods including seafood, meat and vegetables without burning. The ceramic stone is designed to evenly distribute the heat. The Emile Henry Ceramic Black BBQ Grill comes with 8 metal skewers to create delicious juicy kebabs on your barbecue. The ceramic grill is designed to evenly distribute the heat so your kebabs won’t burn. Create a succulent, juicy fish on the barbecue with the Emile Henry BBQ Ceramic Fish Grill. Made in France, the ceramic stone helps to diffuse the heat so your fish won’t burn. Simple enough for everyday – bold enough to make an impression, Salt&Pepper’s LOFT kitchen and table-ware range is inspired by Scandinavian style. Combining modern simplicity, bold graphic and the timeless organic beauty of wood LOFT offers a neutral palette and range of pieces designed to sit perfectly with your decor. Store and display your coffee, tea and sugar with the stylish S&P Loft Glass Canisters Set. Each set features three clear glass canisters, labelled “tea”, “coffee” and “sugar” and comes with a wooden rubber-sealed lid. Store oil and vinegar in matching containers, with the S&P Loft Oil & Vinegar Set. Each set includes 1 x container labelled “O” for oil and one labelled “V” for vinegar. Each bottle has a capacity of 250mL. Have some salt and pepper ready at the dinner table in these neat S&P Loft Salt & Pepper Shakers. The clean bold graphic design makes it easy to distinguish and makes for a wonderful addition to the decor. The S&P Loft Share Board is a great presentation board for serving a row of selected food for your family, friends and guests. It is also ideal for serving food in a linear presentation. Keep your coffee, sugar and tea sealed with the S&P Loft White Ceramic Canisters Set. Each set features three white ceramic canisters, labelled “tea”, “coffee” and “sugar”. Store and keep your salt within handy reach, with the S&P Loft White Salt Caddy with Spoon. The container is made from ceramic and comes with a wooden lid. Perfect for a dual purpose, the S&P Loft Conversion Board can be used as a chopping board and as a quick, handy way of converting measurements from one unit to another. Features a chart for volumes, dry goods and temperatures. Makes preparing recipes so much easier.